I've checked the ones on eBay, do any of them have independent website or do they all sell through eBay? Nothing used on eBay and I was about to pull the trigger on a new pair and now looking for the best deal I can. Maybe someone else can offer feedback on them. That being said, you can never go wrong with 165mm Dura Ace cranks. I wouldn't hesitate to buy a new set if I had the budget for them. There will always be a resale market for them. Small juniors up to 6'4" / 193cm elites use them. They are probably the most popular size with 170mm being second. I have a set of 165mm DA cranks that I'm holding on to in the event that I sell my 165mm SRM set. Last edited by carleton; 06-06-18 at 12:43 AM. Not trade relatef but I'll throw in a mention for https://www.tracksupermarket.com. I've dealt with them before and they were great. 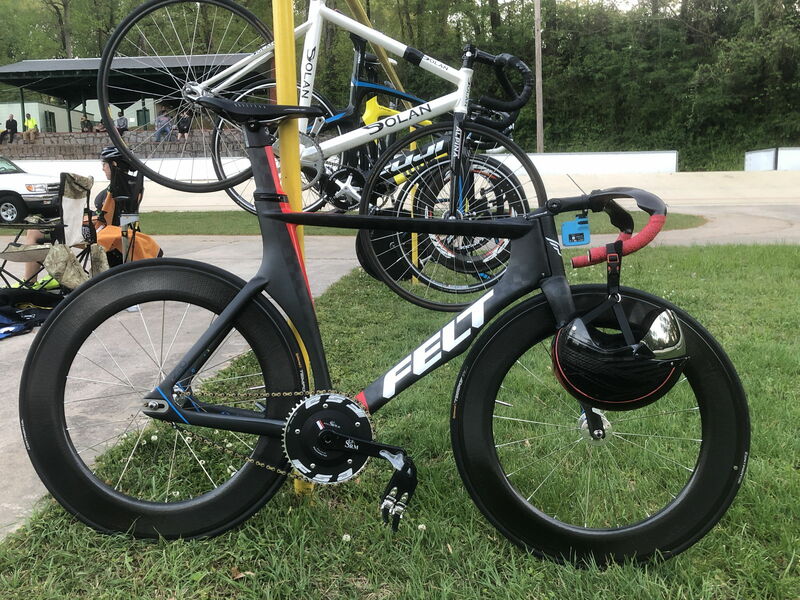 Guy even bought an old set of Zipp track wheels that I was unloading when the trend of expensive track bikes on the streets peaked. Always quick to respond and super helpful. I've ordered from NJS-Export through its eBay site - Phil_the_power_taylor. Placed my order for a couple of chainrings and several cogs on a Thursday afternoon. They were trying to deliver them to me on the east coast on Monday. Everything was in great shape. I could barely tell it had been used. I think the eBay stuff tends to be a bit cheaper than the website. I've ordered a lot of stuff from that seller, everything has been in as good or better condition than listed, and he ships fast. The two pages are linked. If you click the "eBay Store" link at the bottom of NJS-Export, it takes you to Phil_the_power_taylor's ebay site. 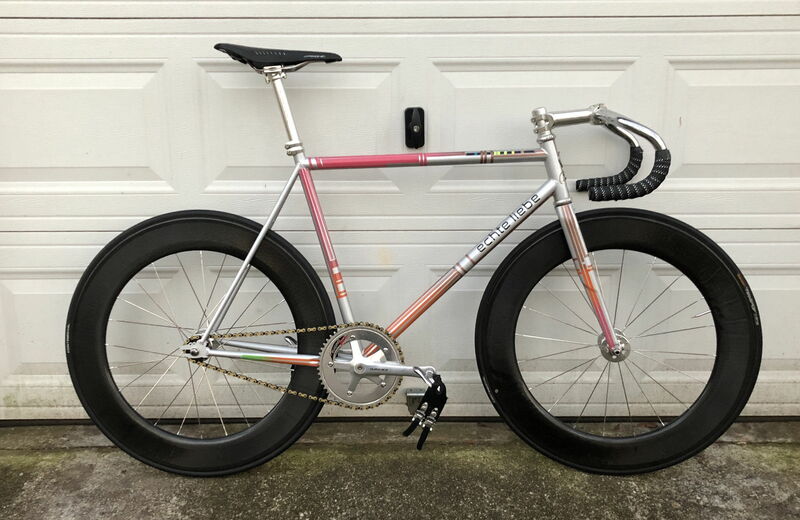 There is a 54cm Langster Pro for sale on the Facebook Buying/selling track parts page. Last edited by gycho77; 12-19-18 at 01:47 AM. Mostly I want this stuff gone, and if you could put it to use, that'sg reat. - Zipp Firecrest 808 Track (with silver hubs using 15mm nuts front/rear). Excellent condition. - FSA chainring, 52t excellent condition. - Handbuilt 36 spoke training wheels set. I believe the hubs are Formula and rims are Velocity. Made for 2,500w sprinters. - 165mm Dura Ace crankset, very good condition. - I'm getting out of the track riding/racing game. - PM me, I guess. Last edited by carleton; 04-06-19 at 10:48 PM. Reason: Dolan/Navigator 5 spoke no longer available. - Dolan Navigator clincher 5 spoke. Excellent condition. Do you still have those chainrings available? Yes. The list is up to date. I would send you a DM, but I can't due to my lack of posting. I'm interested in the 47-50 Zen chainrings. The 50t Zen has just become unavailable this morning. Updated my list above. Everything listed is still available. Last edited by carleton; 03-17-19 at 11:32 PM. You getting rid of the frames? Stages (Gen2) Dura Ace track model - 167.5 length. Fair amount of trainer miles, condition is excellent, no dropouts. SINZ crank - 155mm 110bcd (square taper) good cheap way to test lengths. 3T Ventus (gen1) Team - probably the fastest bar ever made. Not UCI legal unfortunately. This is one with the negative ° stem, like new condition. 3T Brezza Nano - Been using this bar the last few years, some scratches on the right side where bike fell over. 8/10 condition. Have a fair amount of spare parts for it as well. 3T Aduro Aerobars - I bought this from a friend last year as a project. Has the high and low v mount, but some of the small parts are missing. 6/10 condition only because previous owner tried to bore out on of the (non structural) holes in the base bar to, I'm guessing, gain a little clearance for the bolt that runs through it. 3T Sphinx bars - New condition, literally installed a stem and soyo grips, then decided they weren't for me. Included is a zipp (aluminum) stem short enough that you've got a chance of actually being able to ride them in a race. Walker Brothers REVO2 Disc Wheels (Front/Rear) Matching with white Decals, both have Miche hubs, front one has the logo in it, rear does not. (Rear is an older model than the front) - Last season the rear had an issue with some of the tensioners coming loose. It was sent back to Walker Brothers and serviced with the tensioners updated like the new wheels are (shouldn't happen again) Front is newer and has the new method. Rear wheel has a fair amount of miles, front wheel I bought used (from Walker Brothers) but has had no miles from me. Both in excellent condition. Castelli Body Paint 2.0 - Size Medium, some pin holes but overall great condition. LOOK Ergostem - 1 1/8 and 31.8 clamps. All the "teeth" in the plates seem good, when tightened down no slipping. HALO Sport Neuro Headphones - Like new condition, additional bluetooth jack. Carry case included. Aerocoach Align Armrests - V1 (white) and V2 (black) - V1 condition is good/fair, marks from where they have been mounted. V2 are in excellent condition. As you can see I'm a bit all over the place. Projects nobody else wants / misfit toys. Last edited by Morelock; 04-02-19 at 07:31 AM. Hi Morelock, interested in some of your stuff but unable to private msg u, any other methods? email? Last edited by Morelock; 03-26-19 at 07:20 AM. I've updated my list above. The Dolan/Navigator 5 spoke is no longer available.